Pineapple has always been a great fruit to eat. They say, and this is from many grandmas’ across the world, if you have pets in the house, you should consume pineapple as it helps get rid of the hair that could have found a place in your stomach! True, not true, I really don’t know. But pineapple is really good for the digestive system and helps clean up the stomach. Science says that the Bromelain enzyme present in the core of pineapples helps digest protein breaking it down. Pineapple is also great for those with hair problems, as it contains thiamine and biotin. It also keeps bones healthy and helps synthesise fatty foods! 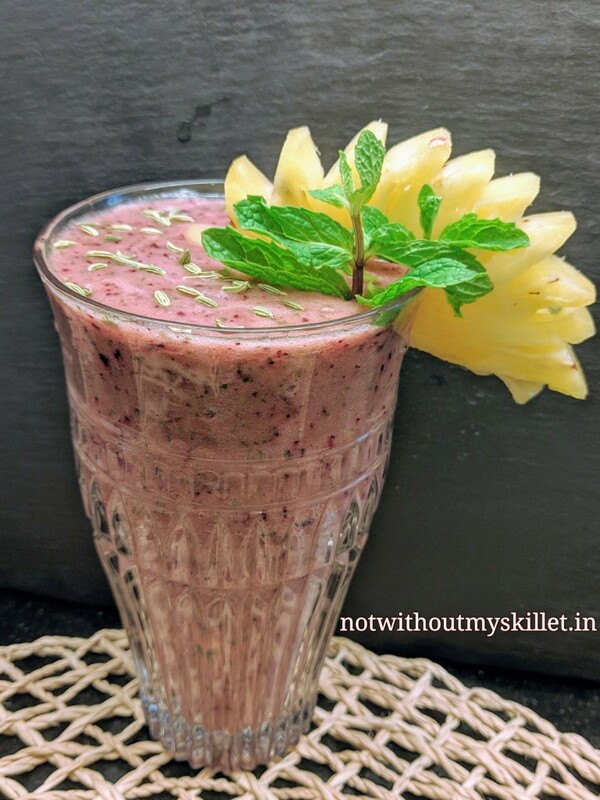 So coming to the juice, pineapples are available in plenty these days, here’s how you can make an awesome breakfast juice, that will keep u going till lunchtime! Just to recap, I prefer to blend my ingredients than juice them because essentially the fibre present in the veggies and fruits is one of the most important elements in food and juicing knocks them off, but juicing does make the juice nutrient rich. To differentiate between the two, blended juices are called smoothies and you can add many more ingredients to them. Blending also makes the smoothie robust and keeps you full for longer, making it ideal for breakfast. I also do not add any ice or sugar to my smoothies. Makes no sense watering it down, right? Blend them all together and pour into a glass. PINEAPPLES are rich in vitamins, enzymes that aid digestion and antioxidants that boost the immune system, they also build strong bones. BLUEBERRIES are extremely high in antioxidants and are proven to prevent some kinds of cancer. They are also rich in fibre, aiding digestion and weight loss.